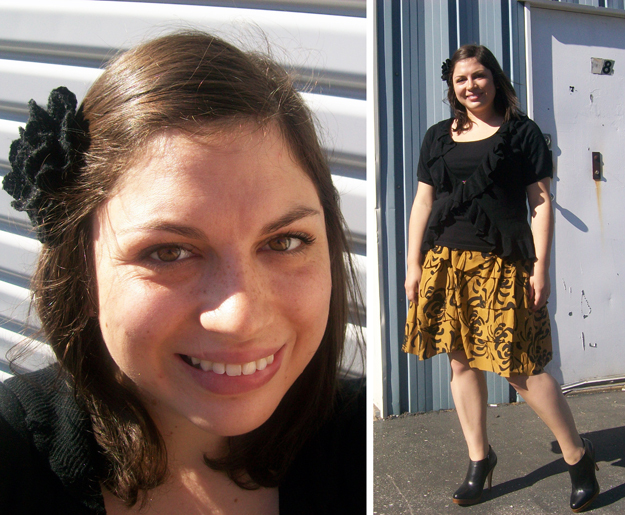 Mariah from Mind of Mister says: "My favorite fall outfit can be summed up in three words: booties, ruffles, and tiers. I love anything feminine and girly and the fact that I found this skirt in my favorite colors - black and yellow - was just an added bonus. It's so comfortable and easy to wear, and I like to let it stand out. Who can resist a great pair of ankle boots? I go crazy for them! They are a great option when you need a sturdy and warm shoe, but don't want to break out those tall boots just yet. To me, the perfect fall outfit is easy and fun. Add a cute hair accessory for a little extra sparkle, and I am good to go! Happy fall dressing, everyone!" love the print of that skirt! Hey Mariah! You are a doll! I love that printed skirt. I am such a fan of mustard. Adorable!